Know what weather is coming your way with future-cast technology, allowing you to see hi-def radar and anticipated conditions one hour into the future. 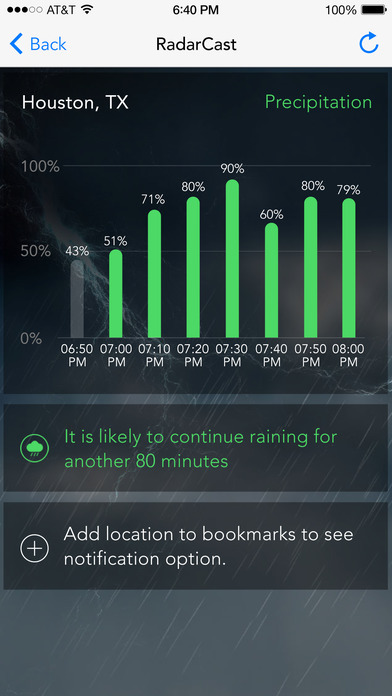 Instantly know when it’s about to rain or snow with push-notifications to your iPhone, iPad, and Apple Watch. - If you live in a very-high-altitude town in Colorado (e.g. Fraser, Vail, Aspen), most likely this app will not meet your needs since radar beams get blocked by the tall mountains. Alaska coverage includes only the southern coastal areas, and does not include the Aleutian Chain. Cloud coverage does not include Alaska and Guam. 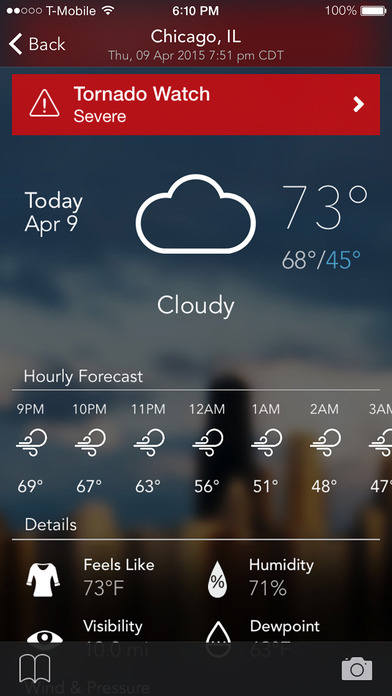 Also, push-notifications for rain will not work reliably in Hawaii, Guam and Alaska. Aviation Sectional Charts are not available for Hawaii.